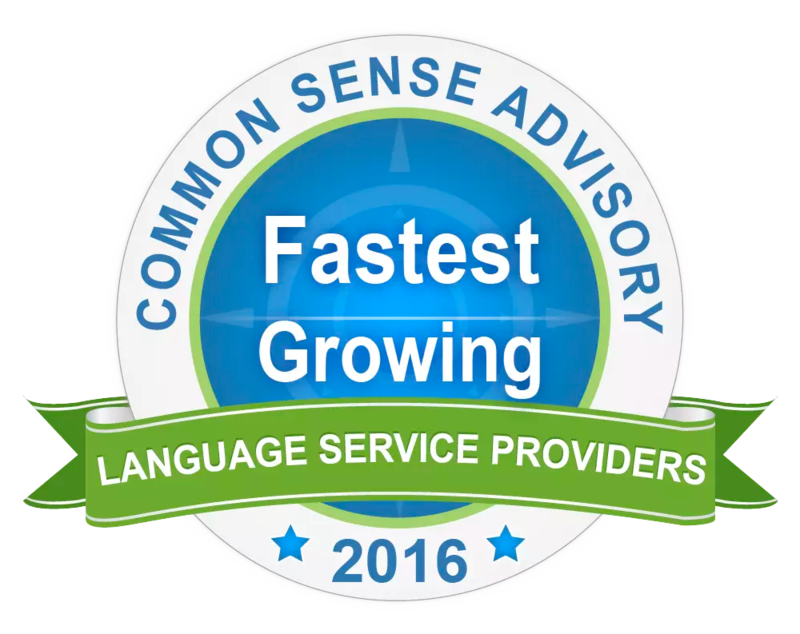 PLANO, TX – March 13, 2017 – Independent market research firm Common Sense Advisory (CSA Research) has ranked Akorbi as the 3rd fastest-growing language service provider (LSP) in the world, with a growth rate of 177.27% from 2013-2015, in their report titled, “The Fastest-Growing LSPs 2016.” The same report, which addresses the $40.27 billion global market for outsourced language services and technology, ranked Akorbi as the 16th largest LSP in North America. CSA Research, which has published market size estimates and global rankings for the past 11 years, found that the demand for language services continues and is growing at an annual rate of 5.52%. Akorbi’s compound annual growth rate (CAGR) of 38.8% over the last few years surpasses the market’s average one-year growth rate. The Inc. 5000 and Women Presidents’ Organization have also recognized Akorbi’s soaring revenue and fast-growth – an impressive 1,267% in the last 5 years (from 2012 – 2016). This is mainly due to the company’s rapid expansion of services, making it one of the most diversified LSPs in North America. Akorbi’s six divisions offer enterprise solutions such as video mobility, staffing, multilingual BPO, translation, interpretation and learning services to support enterprises in the global economy. Akorbi’s fast-growth business model includes hiring top industry talent, growing its highly experienced senior management team and expanding its global workforce of more than 900 people. The company is 100% entrepreneurial, flexible, owns its entire technology infrastructure and continues to invest heavily in intellectual property. For example, Akorbi currently has a patent-pending delivery platform that will provide enterprise solutions and processes for all language services. Companies will be able to access a wider range of services and market analytics, so they can better serve clients with limited English proficiency. As organizations address more languages, CSA Research predicts that the language services industry will continue to grow and that the market will increase to $45 billion by 2020. “The recipe for success doesn’t change much year after year. Fastest-growing companies credit their performance to being sales-driven organizations, developing their existing client base and investing in the future,” adds Don DePalma, CSA Research’s founder and Chief Strategy Officer. Akorbi is a U.S.-based company with over 930 employees around the world providing enterprise solutions that empower companies to achieve success in the global economy. We help companies connect with employees, vendors and customers in over 170 languages 24×7, in any modality, from any location. Our customizable, enterprise solutions include: technical and multilingual staffing, learning services, multilingual contact centers, video remote solutions, translation/localization and in-person interpretation services. The company holds several certifications including ISO 9001:2008, ISO 13485:2003, EN 15038:2006 and M/WBE Certification. For more information, visit www.akorbi.com or call 1.877.4.AKORBI.